THE STORY - When scientists discover how to shrink humans to five inches tall as a solution to overpopulation, Paul (Matt Damon) and his wife Audrey (Kristen Wiig) decide to abandon their stressed lives in order to get small and move to a new downsized community — a choice that triggers life-changing adventures. THE GOOD - Alexander Payne is obviously passionate about this high concept quirky movie. Any time spent exploring the ideas of shrinking and what it would mean for humanity makes for an enjoyable time. THE BAD - Payne throws everything, including the kitchen sink into his screenplay. The film wants to make big claims about the world's problems and tell an interesting dramatic story and in attempting to do so, it ultimately fails at both. ​"Downsizing" is one of the most interesting movies of 2017. It is a high concept science fiction story from Academy Award winner Alexander Payne ("Sideways," "The Descendants" and "Nebraska"). It features a great ensemble cast that includes Matt Damon, Christoph Waltz, and Kristen Wiig. It is a film that has the opportunity to give some commentary on the biggest issues our world faces today, while also telling a personal story with some witty writing. Unfortunately, as interesting as it may be, "interesting" does not automatically equal "successful" as "Downsizing" proves to be a huge mess of a film and the first true genuine misfire of Alexander Payne's career. Payne has been said to be developing "Downsizing" on and off over the past decade and while watching you can tell it really does feel like a passion project for the "Election" filmmaker. It seems as though Payne took all of the goodwill he had been building up with his awards-friendly fare and used it in order to make something really out there. The one thing to be said about "Downsizing" is that Payne really goes for it, he doesn’t hold anything back. If Payne had an idea revolving around this concept of scale/shrinking, he put in in the movie, and that over excess works towards the film’s ultimate demerit. Saying that "Downsizing" is overstuffed would be underselling it. The amount of ground we cover in this 2 hour 15 minute movie could honestly be better served over a few seasons of television. It lays out the rules of its world in the first act, once those rules have been established they introduce a conflict and the story plays out in the midst of those rules. Now while this all seems pretty standard on the surface, "Downsizing" feels like three movies instead of one. The first act takes us through the process of learning about "the procedure commonly known as downsizing." It introduces us to how the world is reacting to this scientific breakthrough while also showing why the common man would take on this endeavor. Yes, you will be helping the environment and "saving the world," but also your thousands of dollars in savings turns into millions in this new small world where you can also retire at the age of 40. The idea of people becoming small for selfish reasons only to find real purpose in helping others and saving the planet? Hey, that is a pretty good story, but "Downsizing" doesn’t stop there. There is a version of "Downsizing" that takes this big concept and tells a pretty straightforward story. Act 1 - introduce the science and how our character reacts to it. Act 2 - maybe the grass really isn’t greener on the other side? Act 3 - ok, it turns out the grass IS greener, but it just wasn’t what the lead character was expecting. Instead, our character learned something about the world and the human condition. However, the reality of "Downsizing" is that there are three harshly different acts, and each third of the movie seems untethered to the events of the other two. It is unfortunate that "Downsizing" is such a storytelling mess. 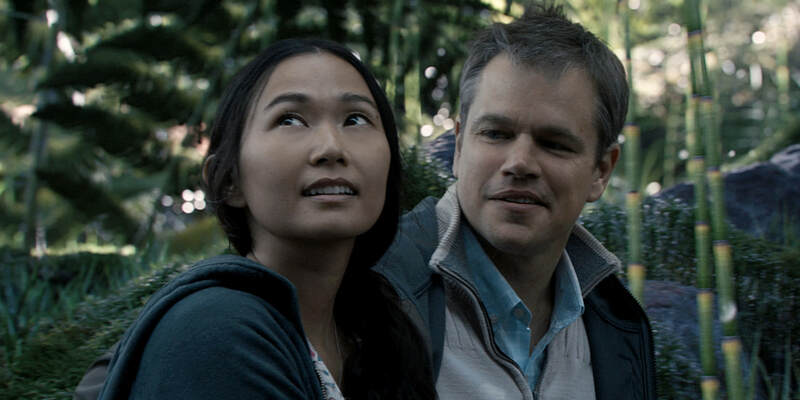 Matt Damon and Christoph Waltz give honestly good performances, the script tells a dramatic story with some pretty effective comedy thrown in to help us accept the high concept, and Hong Chau steals the show with a funny, yet emotional role. The film really does want to say big things about the issues of overpopulation, climate change and the class system we see in a capitalistic society, but it also really wants to focus in on one man’s journey of self-discovery. Of course, a lot of films have to balance their surface level stories while also giving subtext to bigger issues, but Payne simply has too many ideas at play here. As a result, everything is shallow, both the commentary on climate change and the on-screen development of our characters are underdeveloped. Again, there is a simpler version of “Downsizing” out there that could have been more successful. Matt Damon finds a purpose in his life, all in the midst of a fun sci-fi concept? That would make a pretty entertaining film and that story is in here...during the first two acts. Without spoiling anything, I’ll just say this: the third act of this movie is so out of nowhere, so disjointed from the rest of the movie, that it brings the overall enjoyment of the whole film down. Like I said, it feels as though Payne was afraid he’d never get to make a "big" movie again, so he threw everything into "Downsizing." It shows. There is pretty much a full three-act arc within each act of the movie. "Downsizing" would honestly be more successful as a trilogy of high concept Alexander Payne movies. As is, this overstuffed high concept fantasy film from the same filmmaker who gave intimate Academy Award-winning dramedys, is a confused mess that is teetering with the idea of being an enjoyable movie, while the 27 additional ideas thrown at you in the third act absolutely derail the film as a whole. Alexander Payne completionists might be able to forgive the film’s misgivings, but as a whole, many will leave the theater unsatisfied.